I do not intend to cover this outbreak in great detail as it is already well served by T. Meirion Hughes's excellent bilingual book: "The Cholera and the New Water Supply/Y Colera a'r Gronfa Ddwr Newydd" (ISBN 09252493616). Suffice to say that this was the last, and by far the worst, outbreak of the disease to hit the town. 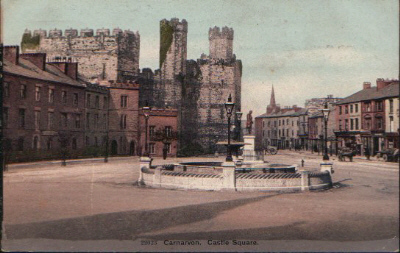 The severity of this outbreak led directly to the introduction of a fresh water supply to all inhabitants, which was heralded by the opening of the fountain on Castle Square in 1868. Briefly, the town of Carnarvon had always been served by an inadequate, and very unhealthy, water supply, which was compounded by the rapid expansion of the town during the boom years of the slate trade in the first half of the century. 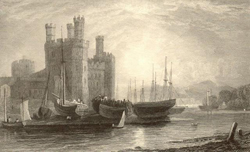 This was fertile ground for a disease such as cholera, and as has been seen it was only through good fortune that decimation on a grand scale had been avoided over the last forty years. 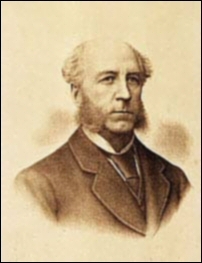 The appalling state of the town's sanitation had attracted attention many times over the years, most specifically by the Mayor, Sir Llewelyn Turner. Up until 1866 his attempts had fallen on deaf ears and nothing had been done. This was not an unusual situation as the Town Council had an enduring record of failing to agree on a multitude of projects aimed at improving the town. Most often this was down to sheer pig-headedness and personality clashes on the part of individual councillors, and a cynical reluctance to spend any money on the poor. This was the sad state of affairs then as the summer of 1866 progressed. On the 17th. of October four-year-old Simon Hobley, of Turf Square, became the first official victim of the outbreak, although there had been sporadic deaths from diarrhoea and similar ailments since mid-June. The following is a list of all the victims. The list is compiled from the Civil Registration Death Register and the Llanbeblig Parish Burial Register. I have included any instances of deaths due to diarrhoea and "gastric fever" as they might possibly be Cholera related. In all there were 78 confirmed Cholera victims, with a further 20 possible cases having died from Diarrhoea or Gastric Fever. There were also six persons noted in the Llanbeblig Burial Register as having died of Cholera, but the official cause of death in Civil Registration Registers was otherwise noted. General Register Office - Register of Deaths.